NEW UPSL club, Bat Country Football Club have chosen Admiral® to supply the club with all sportswear and technical kit from the 2019 season. Based in Temple (Texas), Bat Country Football Club will begin play in the UPSL Central Conference. NEW UPSL club, Inter Orlando Academy have chosen Admiral® to supply the club with all sportswear and technical kit from the 2019 season. Founded in October 2017, it is the newest Professional Soccer Club in Orlando, Florida. The club includes; Adult Semi-Pro, Competitive Youth Academy and a Recreational Community Programs. NEW UPSL club, Springfield FC have chosen Admiral® to supply the club with all sportswear and technical kit from the 2019 season. Based in Springfield (Ill.) Springfield FC begins UPSL Championship play in the Midwest Conference. NEW UPSL club, AC Miracle Hill have partnered with Admiral® who will supply the club with all sportswear and technical kit from the 2019 season. Based in Desert Hot Springs (Calif.), AC Miracle Hill begins UPSL Championship play in the Western Conference. NEW UPSL, Huracan ECUSA FC have chosen Admiral® to be the club’s official sportswear and technical kit supplier from the 2018 season. Based in Clearwater (Fla.), Huracan ECUSA FC play in the UPSL Pro premier Southeast Conference Florida Central Division. Admiral Sports is pleased to announce a strategic partnership with Coyotes FC, a United Premier Soccer League (UPSL) side playing in the league’s Pro Premier Central Conference Heart Division. The United Premier Soccer League (UPSL) is the fastest growing Pro Development Soccer league in America made up of 164 teams in 19 divisions nationally. Leicestershire born Christopher Cook and Harold Hurst began manufacturing hosiery in 1908 under the company name of 'Cook & Hurst Ltd' in Wigston. They first created the Admiral trademark in 1914 to brand their ranges of underwear. It wasn't until England’s 1966 World Cup success that they began to manufacture sportswear. Capitalising on the advent of colour television and the heightened excitement in English football, the then owner of Cook & Hurst, Mr. T. H. Patrick, persuaded football clubs to accept individually personalised kits, which his designers would then produce and register under the Design Copyright and Patents Act. Mr Patrick then manufactured and marketed football kits, targeting young fans who wished to emulate their football idols. In doing so, Admiral became the original pioneers in the development of the replica kit market, supplying clubs and their fans with individually designed home and away kits, featuring distinctive colours, the Admiral logo and club crests. In the 1973/74 season, Leeds United became the first English top flight club to wear visibly branded kit - the Admiral logo was positioned proudly on the shirt and shorts. The kit was also made of a new lighter material, rather than cotton, which had been the norm for football clubs for many years. A further feature was that the socks had tags, which identified each player's number. Fans and in particular, children, loved being able to buy and wear the same style and colour kit as their heroes and the market grew rapidly. Building on the domestic market success, Admiral agreed a ground-breaking five-year contract with the English FA in 1974, to produce the first commercially available England shirt. The new shirt was first worn in a 3-0 victory over Czechoslovakia on 30th October 1974. The Admiral logo was positioned alongside the Three Lions of England, the first time any manufacture had been given such a prestigious honour. Further afield, Admiral had also grown to produce kits for many NASL teams in the US during the late 70's and had a replica licensing deal with all clubs, including the New York Cosmos. 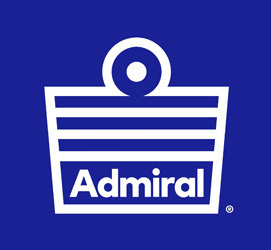 Admiral continued its rapid expansion into the 1980's, and although the sector became very competitive, the brand continued to be worn by many clubs including; Leicester City, Derby County, Hull City, Crystal Palace and Bradford City. Admiral continued as the official kit suppliers to the England National team into the earlier 80's. The team wore the now famous Admiral white home and red away strip in the 1982 World Cup Finals held in Spain. The team wore the white kit for three games during the finals: with wins over Czechoslovakia (2-0) and Kuwait (1-0), along with a 0-0 draw with Spain in the second stage. The red away kit was worn in a superb 3-1 win over France, included Bryan Robson's 27 second goal - one of the fastest in World Cup history. Admiral entered the 1990's well placed to build upon its widespread recognition and continued to supply clubs including; Leeds United, Dynamo Kiev, Southampton, Middlesbrough, Bradford City, Charlton Athletic, Wimbledon, Hearts, Motherwell and Glasgow Rangers. Leeds United won their 3rd, First Division Football League title in the 1991-92 season. Beating their nearest challengers, Manchester United to the coveted award. In 2000, Admiral became the official kit supplier to the England Cricket Team. Admiral also produced kits for the South African and West Indies cricket teams. The England cricket team, managed one of the biggest sporting conquests in recent times - winning a thrilling ashes series in 2005 after 18 years of hurt. In 2011 “Admiral Sportswear” was established, putting the brand back in British ownership and with new impetus, plans to reignite the brand are beginning to gain momentum. In January 2012, Admiral launch their brand new menswear collection, Admiral Gold. This collection will be delivered into store for Autumn/Winter in late 2012. 2013 has seen Admiral re-energised and renewing our historical partnerships with the re-signing of the West Indies cricket team, through to being re-united with the Tampa Bay Rowdies after nearly 30 years! It was also the year when we saw the re-launch of famous Admiral Club retro shirts from clubs including; Tottenham Hotspur, Leicester City, Coventry City and Luton Town amongst others. The year was completed with the new introduction of new Admiral Performance Training apparel, as the Admiral brand headed towards its Centenary celebrations. 2014 will see Admiral celebrating its 100th Anniversary. To mark this special year, we’ll see Centenary product collections across the world of Admiral from Japan through to the USA, in a year when football’s global elite will meet in Brazil! Celebrate the 100th Anniversary with us next year; celebrate 100 sporting years of one Britain’s favourite sporting icons! 2015 sees the re-energising of the Admiral brand with increased exposure in high street stores and on the field of play! New ranges of Admiral footwear will be launched in 2015, together with new Sports Performance, Retro and Admiral Gold ranges of clothing. The Admiral brand’s reach will continue to extend in 2015, with the famous ensign logo now appearing in new stores in Norway, Italy, France, Germany, Spain and Portugal and plans to sign new teams, the future is very exciting for one of Britain’s most famous sporting icons. The Admiral Gold collection for 2016 will see the brand’s further extension into sports casual fashion. Featuring the now distinct Admiral Gold logo, the new ranges feature new designs of shirting, knitwear, polos, jackets and t-shirts. Admiral will also launch new collections for 2016 in Retro & Performance wear, featuring the iconic Admiral Ensign both on and off the pitch.